New York : W.W. Norton, 2010, c2007. "A beloved writing teacher compiles fifteen years of her expertise, exercises, and examples in a new primer for creative writers on the art of fiction and nonfiction"--P.  of cover. Norton Guides are typically used as textbooks, often in introductory college classes. They tend to be well-produced, expertly written, and extremely practical as pedagogical tools (usually with enough flexibility to enable an instructor to take them in different directions as the need arises). The Making of a Story by Alice LaPlante meets all of these points and more. 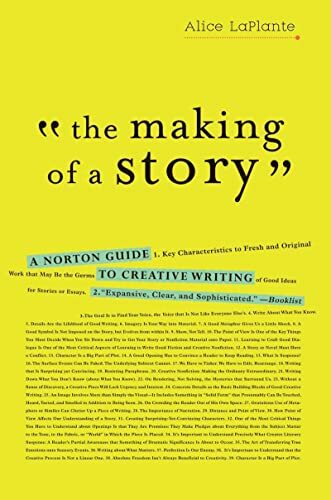 Over fourteen chapters it presents a sensible survey of key points in the production of both fiction and creative non-fiction, including chapters on characterisation, narration, point of view, dialogue, and more. While each chapter is useful, I would say that the penultimate chapter on revision, “Learning to Fail Better”, is the most useful of all, not least because of its recognition of the limitations of the (typical) workshop method of teaching creative writing. Each chapter contains a set of two or more exercises to help reinforce the main points of the chapter. These exercises are very well constructed, neither too lengthy (they could easily be done within a class) nor too arch (they don’t seem excessively contrived). Some draw upon whatever writing the participant may have been doing in his or her own time, but most are standalone exercises, which is better. Good exercises to get the creative juices flowing after several years of being blocked. pretty good intro to fiction writing. Nice exercises even though LaPlante is very quote heavy.